Definition at line 41 of file xsthread.h. Definition at line 37 of file xsthread.h. Definition at line 33 of file xsthread.h. Definition at line 29 of file xsthread.h. Definition at line 67 of file xsthread.h. Definition at line 65 of file xsthread.h. Definition at line 63 of file xsthread.h. Definition at line 64 of file xsthread.h. Definition at line 91 of file xsthread.h. Definition at line 90 of file xsthread.h. Definition at line 95 of file xsthread.h. Definition at line 93 of file xsthread.h. Definition at line 94 of file xsthread.h. Start a function as a thread. Definition at line 86 of file xsthread.h. Definition at line 92 of file xsthread.h. Release the remainder of the timeslice so other operations can run. On Windows this is done using Sleep(0), since this is the most reliable method. 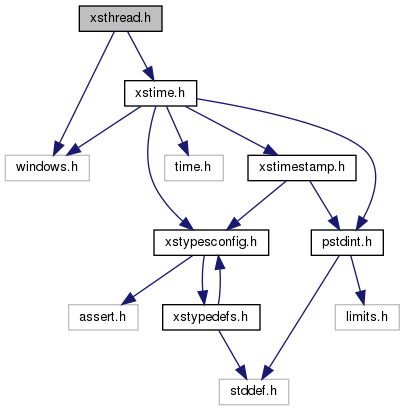 SwitchToThread can cause delays since it does not allow the thread to resume on a different core. Sleep http://msdn.microsoft.com/en-us/library/ms686298%28v=vs.85%29.aspx SwitchToThread http://msdn.microsoft.com/en-us/library/ms686352%28v=vs.85%29.aspx. Definition at line 75 of file xsthread.h. A handle for a thread. Definition at line 78 of file xsthread.h. Definition at line 82 of file xsthread.h. Definition at line 155 of file xsthread.h.